Now that winter is fleeing, we are thinking back to all the good sledding days we didn't take full advantage of. How come there aren't more night sledding runs in New York City anyway? We haven't solved the problem of needing to sled in darkness, but at least someone else had solved the problem of sledding in the summer. The Slicer by Ice Meister is definitely something to live in our bowl of tricks. If we could start that summer camp, we'd put six on the shelf and have weekly races down Wipe-out Lane! Winner gets to jump in the mud pool. For snow sledding, the SLICER works like any normal sled that is placed on a slope that is covered with snow or ice. But to slide down grass covered slopes, just the opposite is done: instead of putting the SLICERTM on the snow or ice, ice is put on the bottom of the SLICERTM! 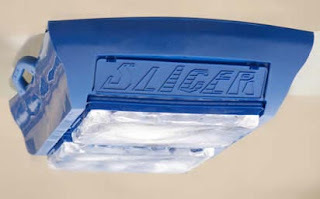 Inside the SLICER's hollow, double-walled construction are two patent pending (in USA, Canada, and Europe) Icers that can be removed (from within the inside of the sled) and then used to freeze and form thin ice blocks that can then be easily attached to the bottom of the SLICER. When outdoor temperatures are above freezing, the melting ice provides for a very slippery surface, providing winter sledding fun in the summer! The SLICER does not take a back seat to other sleds, either, when used in the winter on snow. Its smooth contoured shape and low profile runners enable it to work well on packed snow as well as deep powder. Owing to its double-walled, unibody design, the SLICER is able to absorb bumps while cushioning riders weighing up to 200 lbs. 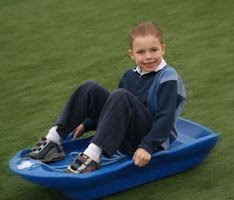 And its rugged polyethylene plastic design makes it less than the cost of many snow-only sleds.